For decades Studio Ghibli has created breathtakingly beautiful movies that have captivated and inspired audiences for generations through masterful storytelling and stunning visuals. Join GKIDS and Fathom Events for the third annual Studio Ghibli Fest to experience the wonder of these groundbreaking, beloved animated films. 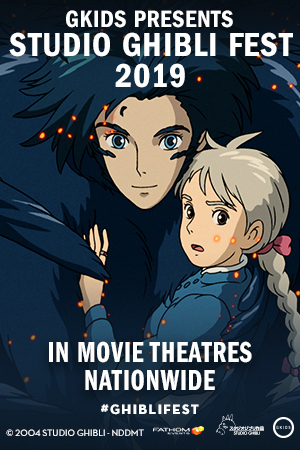 This year’s series will highlight nine of Studio Ghibli’s most treasured films on the big screen including Howl’s Moving Castle, Nausicaä of the Valley of the Wind, Whisper of the Heart, Kiki’s Delivery Service, My Neighbor Totoro, The Secret World of Arrietty, Spirited Away, Princess Mononoke and The Tale of The Princess Kaguya . Starting in April, this series offers both the dubbed and subtitled versions. All Sunday & Wednesday showtimes are dubbed in English. All Monday & Tuesday showtimes are subtitled in English.